EvoBus GmbH have their first customer for the fully-electric Mercedes-Benz Citaro. Representatives of the Daimler subsidiary and Rhein‑Neckar‑Verkehr GmbH have signed a corresponding memorandum of understanding which will allow the first vehicles to be delivered at the end of 2018. They will enter service in the Rhein-Neckar metropolitan region as part of customer trials. This means that the first examples of the fully electric Mercedes-Benz city bus will remain close to home – The electric Citaro's are produced in Mannheim so they will be in service close to where they are manufactured. The two partners have agreed to closely exchange their findings during day‑to‑day regular service operations. The fully‑electric vehicles receive drive energy from lithium‑ion batteries and the modular design of the battery pack means that customised solutions can be devised to match a wide range of applications and requirements in city traffic. 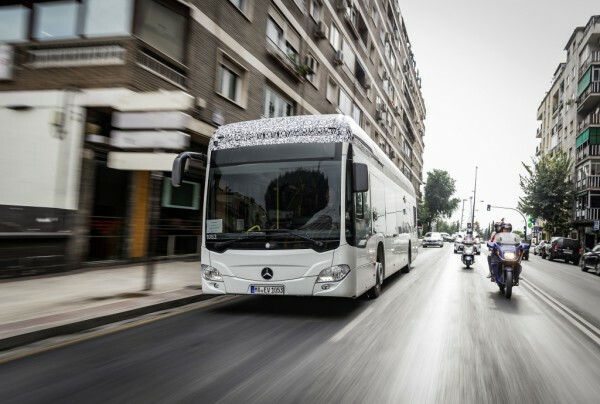 As well as the possibility of charging from a power socket at the depot, Mercedes‑Benz can also optionally supply the Citaro with intermediate recharging solutions. The vehicle is powered by rear axle electric wheel hub motors. One of the particular features of the Citaro with all‑electric drive is the accurate thermal management of the vehicle drive and climate control systems. This reduces energy consumption significantly thus increasing range without increasing the size and capacity of the battery. The all‑electric Citaro is currently being put through comprehensive trials with prototypes having successfully run through initial winter testing at the Arctic circle as well as summer testing in the heat of Spain's Sierra Nevada. Endurance testing and detailed refinements will now follow, ensuring that the all-electrics will be able to offer maximum availability on a par with that of a conventionally powered city bus.